At any given time, there are approximately 59,000 aircraft in flight worldwide — the ability to effectively track, monitor and report these aircraft is paramount to ensuring the safety of passengers and crew, as well as that of communities on the ground. The United Nations specialized agency for information and communication technologies — the International Telecommunication Union (ITU) — which establishes worldwide standards that foster seamless interconnection of a vast range of communications systems, has now adopted the main technical principals of enhanced aircraft automatic dependent surveillance via satellite, to track in-flight aircraft worldwide. Aircraft automatic dependent surveillance is a technique in which aircraft automatically provide, via a data link, data from the on-board navigation and position-fixing systems, including aircraft identification, four-dimensional position (e.g. latitude, longitude, altitude and time) and additional data, as appropriate. The technique is termed “automatic” because there is no intervention from the pilot or interrogation from terrestrial stations, and “dependent” because the data is dependent upon on-board systems such as global positioning system and altimeter. The system relays the information to the relevant airline operators and air traffic control centers who then track the aircraft identifying any anomalies in its flight profile and initiate emergency procedures where necessary, enhancing safety in the sky. Different aircraft automatic dependent surveillance systems have been standardized within the International Civil Aviation Organization (ICAO), such as terrestrial automatic dependent surveillance-broadcast (ADS-B) and automatic dependent surveillance-contract (ADS-C). The technical principals adopted by ITU support implementation of reception of ADS-B via satellite that would enhance surveillance of aircraft, particularly in areas where terrestrial receivers cannot practically be deployed, such as in oceanic, trans-polar and remote regions – and would be a major step in the implementation of the ICAO global aeronautical distress and safety system. ITU Secretary-General Houlin Zhao said that since the tragic loss of life with the disappearance of flight MH370 in 2014 over the South China Sea, ITU has undertaken activities to improve the tracking of in-flight aircraft using advanced information and communication technologies. The adoption of these technical principals for enhanced aircraft surveillance via satellite will make great strides in saving lives. François Rancy, Director of the ITU Radiocommunication Bureau. added that the adoption of the technical principals in ITU’s report is a major step towards improving international global flight traffic safety, through the cooperation between ITU and ICAO, This also advances implementation of World Radiocommunication Conference 2015 decisions on internationally recognized spectrum for aircraft automatic dependent surveillance via satellite. 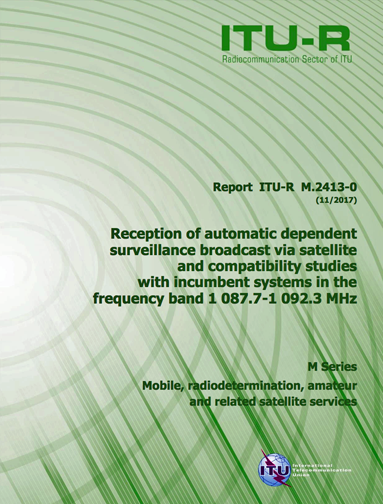 This report was published and adopted by ITU-R Study Group 5, which focuses on systems and networks for fixed, mobile, radiodetermination, amateur and amateur-satellite services. The ITU-R Study Groups develop the global standards (Recommendations), Reports and Handbooks on radiocommunication matters. More than 5,000 specialists, from administrations, the telecommunications industry and academic organizations throughout the world, participate in the work of ITU Study Groups on topics such as efficient management and use of the spectrum/orbit resource, radio systems characteristics and performance, spectrum monitoring and emergency radiocommunications for public protection and disaster relief.